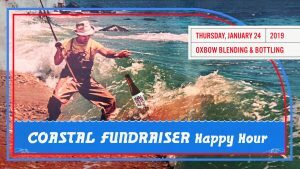 The good folks at Oxbow Blending & Bottling in Portland are hosting a fund raiser on Thursday, January 24 in support of Snap-a-Striper, the collaborative effort by the Gulf of Maine Research Institute and CCA-Maine to collect and analyze valuable biological information obtained from photos of striped bass caught in Maine waters. The event will be held from 6 to 9 p.m at Oxbow’s facility – 49 Washington Avenue in Portland — complete with a cash bar pouring Oxbow beer on tap and snacks from The Bread & Butter Company. There will be a special “clipped” showing of “Running The Coast,” a feature documentary from Howard Films that follows the migration of stripers on the Atlantic Coast, plus special raffle prizes from Patagonia, Oxbow, Howard Films and 158 Picket Street Cafe. Please join us on the 24th and bring your fishing friends for a fun outing in support of important striped bass research here in Maine. The Maine Department of Marine Resources (DMR) is proposing to remove its requirement for the use of non-offset circle hooks when fishing for striped bass (and bluefish) with live or dead bait in Maine waters. To read DMR’s rule-making proposal, go to Maine DMR Circle Hook Rule-Making Proposal. The use of non-offset circle hooks as opposed to offset circles or “J” hooks with bait has been mandated in Maine since 2013. The regulation is widely considered to be good fishery conservation. More often than not, the use of non-offset circle hooks (as opposed to offset circles or “J” hooks) penetrate the jaws of fish, thus making it far easier to release the fish, including undersized stripers which have proliferated along the Maine Coast in recent years. Reducing release mortality was and is the basis for the existing non-offset circle hook regulation in Maine. The CCA-Maine Board of Directors strongly disagrees, as do charter captains, guides and anglers in Maine we fish with who support the use of non-offset circle hooks as an important part of the conservative management of our striped bass resource. These expert fishermen all agree that everything considered, non-offset circle hooks are the most “fish friendly” hooks when fishing with bait for stripers. Striped bass in Maine waters are under pressure from all sides. Water temperatures are rising, predatory seals are on the increase, and fishing pressure on stripers is building as other recreational species like cod, bluefish and flounder are becoming harder to find. And despite the ASMFC-mandated harvest reduction put into place in 2015, preliminary reports at the end of 2018 indicate that striper stocks have not rebounded. Instead of removing the current non-offset circle hook regulation in our waters, we think Maine DMR and the state’s representatives on the ASMFC Striped Bass Advisory Panel should be pressuring the ASMFC and state fishery managers to our south to make non-offset circle hooks mandatory for bait fishing in all the Atlantic Coast striper fisheries. If you agree that non-offset circle hooks make good conservation sense, it’s important that you send your comments to dmr.rulemaking@maine.gov, Attention: Amanda Ellis. The comments deadline is January 21, 2019. Thanks for your continued interest in striped bass conservation. Fishing for striped bass was pretty good along much of the Maine coast this past season and that angling success has added up to another productive year for Snap-a-Striper, the ongoing data collection program in which CCA-Maine and the Gulf of Maine Research Institute (GMRI) are collaborating. Almost 300 photos of stripers with Snap-A-Striper data cards in place were submitted to GMRI scientists via email by anglers, captains and guides during the 2018 season, along with the heads of several legally harvested bass. A number of fish photos were also submitted anonymously by anglers participating in a catch-and-release striper fly fishing tournament. Fish photo submissions started in May and continued through September and came in from as far south as York and as far north as Old Town. GMRI scientists will digitize the 2018 fish photos and add them to a collection of some 1800 photos submitted over the past five years. The photos will be entered in a statistical analysis program and preliminary photo results will be determined over the winter. Chemical analysis will also be conducted on more than 60 striped bass otoliths (ear bones) taken from heads submitted to GMRI over the last few years. The data resulting from these studies will help GMRI scientists determine the origin (locally spawned in the Kennebec River watershed, or migratory) of stripers in Maine waters, information that can improve management of the striped bass resource that is so important to the state’s economy. 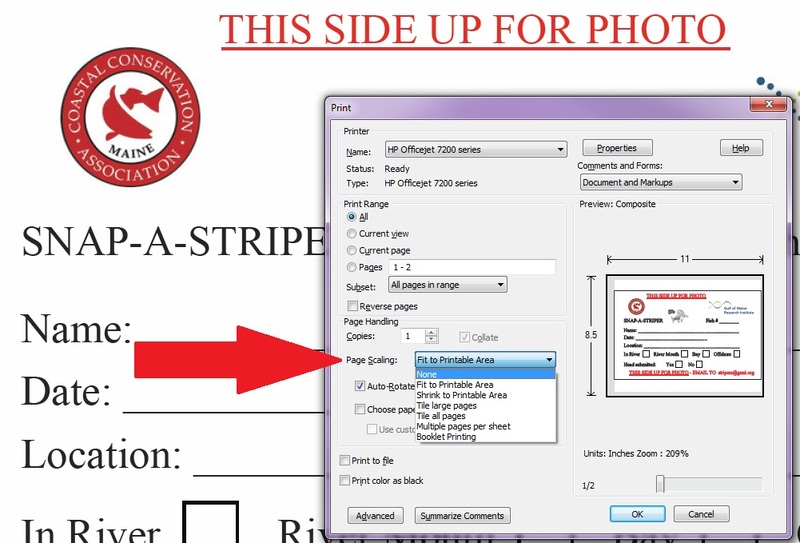 CCA-Maine very much appreciates your interest in Snap-A-Striper. Tight lines and we look forward to your continued support of this important “citizen science” program in 2019. Thanks to all who have participated in this year’s striped bass data collection program. 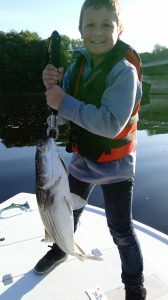 To reward anglers for helping to make this important fishery research program a success, CCA-Maine is awarding gift certificates from their supporters at L.L.Bean, Cabelas and Kittery Trading Post! Snap-A-Striper is an ongoing collaborative effort between the Gulf of Maine Research Institute (GMRI) and CCA-Maine . Body shape data collected from photos of stripers caught in Maine waters with Snap-A-Striper data cards in place, as well as data from the otoliths (ear bones) of legally harvested fish can help GMRI scientists determine the origin (locally spawned or migratory) of stripers in Maine, information that can improve management of the resource. Please help us with this important work by participating in Snap-A-Striper for the remainder of the 2017 striper season. The scientists need all the fish photos you can send. And if you are lucky, you could win one of the prizes that CCA-Maine will be awarding for fish caught from July through September. Learn more about how you can get involved. Get your data cards. Please be sure to include the age of any successful angler 12 or under when you submit your photos. 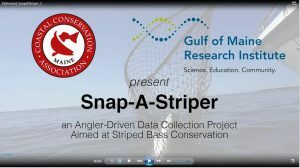 The Coastal Conservation Association-Maine (CCA-Maine) and the Gulf of Maine Research Institute (GMRI) are collaborating on an ongoing data collection program called “Snap-A-Striper,” aimed at compiling photos and valuable information from live release and legally kept striped bass caught in Maine waters. We are looking for anglers — and guides and captains — from Boothbay to Kittery to email photos of stripers with special down-loadable data cards in place (see links below) to the fishery scientists at GMRI. The information developed from your photos could lead to better management of Maine’s striped bass resource. Entries can be submitted starting in June. Prizes will be awarded during the season and the winners will be announced on the CCA-Maine website.Click on the links below for more information on how to participate. 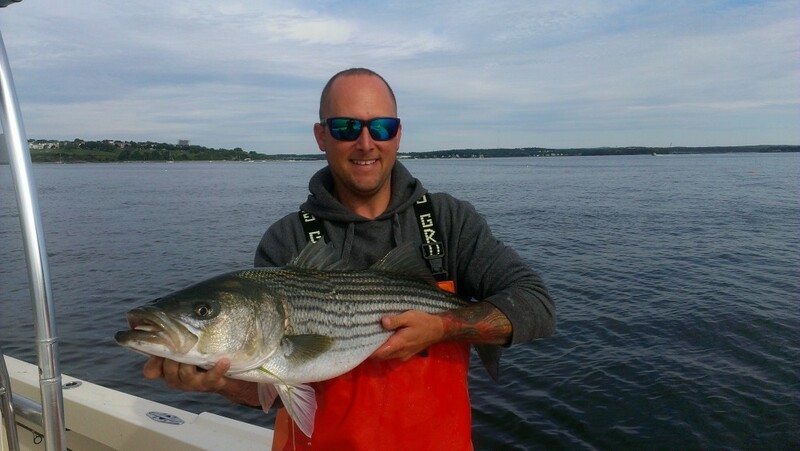 Posted in Uncategorized	| Comments Off on We are Catching Stripers! Entries can be submitted starting in May. Prizes will be awarded during the season and the winners will be announced on the CCA-Maine website. Click on the links below for more information on how to participate.